Published in Broadsheet, Feb 2016. Mavrick is a silversmith who creates jewellery inspired by everyday silhouettes of basketball hoops, pasta tubes, Penrose steps and Slinkies. She steers formal shapes into offbeat territory, turning handmade sculptures into declarations for ears, arms and necks. Her Greek heritage might be explored through oversized resin, wood and found nylon accoutrements that honour Crete summers and Corinthian columns. Then there are the minimal jolts of sterling silver that resemble nails, chains and horseshoes – a reminder that there is beauty in the utilitarian. For my next production I’ve been going through the processes of creating paper cutout maquettes [small scale models] to develop the design forms. I’ve also been looking at the metaphysical paintings of Giorgio de Chirico and some still-life paintings, as well as a collection of everyday interior objects – they’ll be my jumping off points to develop forms for the new work. Read the full feature in Broadsheet. 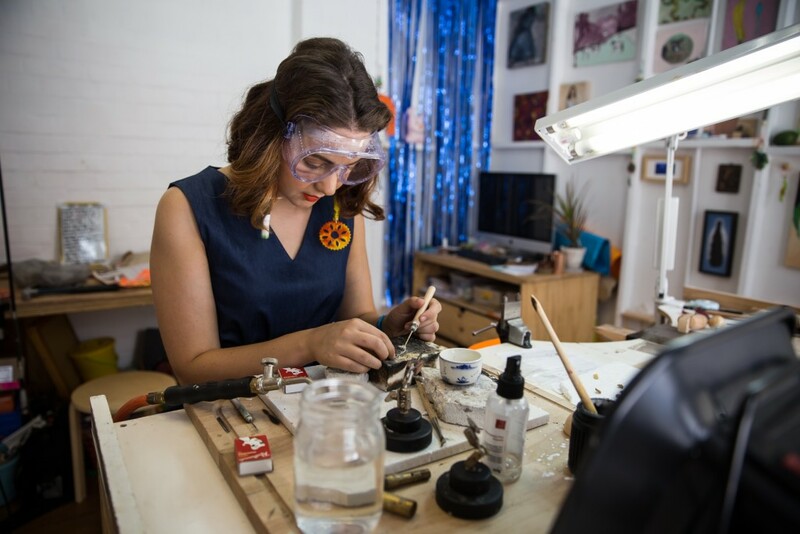 Image: Bianca Mavrick in her Metro Arts studio. Photo: Kirsty Sycz.